Find hotel near Parroquia De Cristo Resuc ..
Cancun’s nightlife and natural beauty might astonish you to a certain extent but those who are looking for some quiet spiritual corners should visit the Parraquia de Cristo Resucitado church. Recently established, this church has become one of the central attractions of Cancun that must be visited for sure. With open interiors and cool heights, this church is in close access from many resorts in Cancun. For those who want to see the church in its full glory, should visit it during the mass. They have the portrait of our lady of Guadalupe in one corner of the church. Ask the locals for the timings of the church. How popular is Parroquia De Cristo Resucitado? People normally club together Isla Mujeres and Cancun Underwater Museum while planning their visit to Parroquia De Cristo Resucitado. Beautiful church! We went on Palm Sunday. They had mass every hour that day. The first was 8am in spanish and at 9am we went to the english mass. Wow, is a beautiful place. Yo can hear Mass and take a time to talk to God. 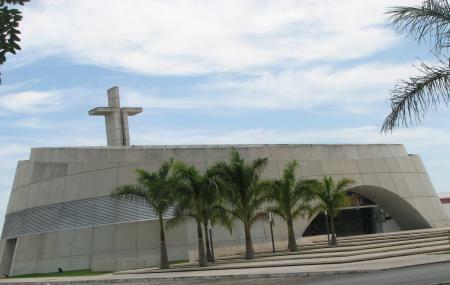 Big open-air concept church in Cancun, just perfect to pray, not much noise from the street. Also, nice small gardens and water spots to relax in harmony. Masses are performed in Spanish everyday. The mass was in Spanish and was great. This is a beautiful and welcoming church with an open air concept.